the effect of the metering rod. At the beginning of the opening stroke, fluid flows out of port A and port B. When the piston has moved approximately 1 inch into the cylinder, the metering rod shuts off the flow of fluid from within the cylinder to port B. At the end of the opening stroke, the orifice snubber controls the escape of fluid from the cylinder, this prevents the moving parts from slamming to a stop and possibly being damaged. When pressurized fluid is applied to port A, the piston moves toward the opposite end of the cylinder to close the steam valve. At the end of the closing stroke, the tapered end of the piston rod enters the flange. This prevents the moving parts from slamming to a stop and possibly being damaged. LAUNCH VALVE STROKE TIMER ELECTRICAL SYSTEM The launch valve stroke timer electrical system (see fig. 4-5) provides a means of measuring the launch valve performance by timing the stroke from fully closed position to the point at which the crosshead has moved 9 inches. When the catapult is fired, fluid pressure from the hydraulic cylinder opening port E actuates the start timing pressure switch. This starts two clocks which measure and displays time in seconds and hundredths of seconds. When the valve opens 3 1/2 inches, a limit switch on the crosshead opens and clock number one stops and display time elapsed. At the 9-inch stroke, a second switch opens, stopping and displaying elapsed time. The timer clocks are located on the main control console for CV-64, CVN-65, and CV-67 and the central charging panel for CVN-68 through CVN 76. Variations in the launching valve stroke rates may seriously affect catapult performance. The launching valve stroke timers provide a means of detecting differences in the launching valve stroke. Deviations in the launching valve stroke can be detected by comparing current timer readings with previously established timer readings. THRUST EXHAUST UNIT The thrust/exhaust units (fig. 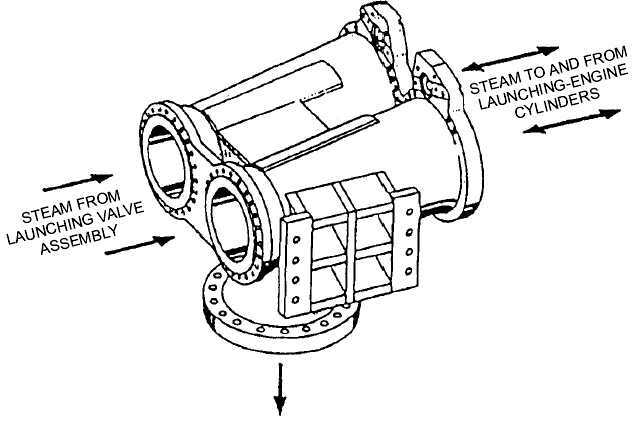 4-9) absorbs the thrust of the launch engine pistons and shuttle assembly, connects the launch valve to the power cylinders and to the exhaust valve, anchors the aft end of the launching, engine and prevents aft expansion of the launching engine cylinders. 4-8 STEAM TO EXHAUST VALVE ABEf0410 Figure 4-9.Thrust exhaust unit.